FOXBORO, Mass. – Foxboro coach Brittany Sherry called Wednesday’s league meeting with King Philip a “must win” game, as the Warriors try to build their resume ahead of the state tournament seeding on Friday. 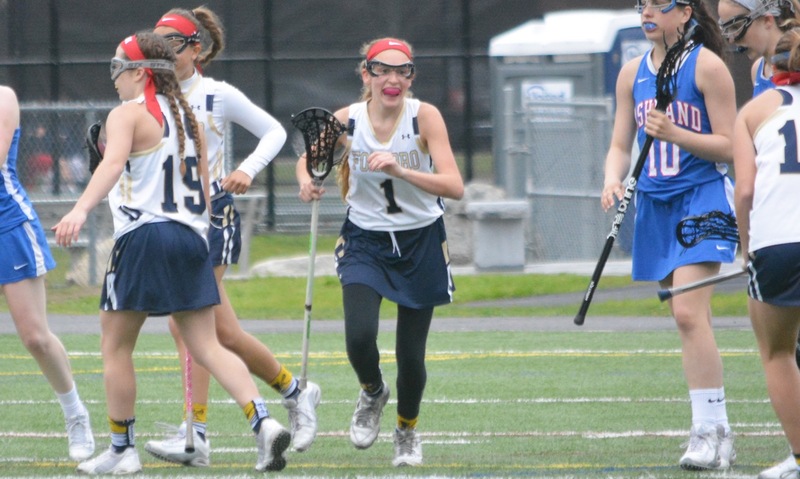 As it has all season long, Foxboro has turned to its underclassmen to provide the scoring punch and freshmen Sophia DiCenso and Caroline McGeary came through in the clutch. The duo combined for the final three goals of the game to halt a KP comeback and lift Foxboro to a 15-13 victory that split the season series. DiCenso led the way with six goals and three assists, all of which came on goals by McGeary, who finished with five, including the eventual game-winner with 5:51 left in the game. At the start of the game, it looked as though KP was going to be able to pull away a win similar to the first meeting (a 15-8 win at Macktaz Field). The visitors had a 3-1 lead with Katie Crowther, Abigail Buchanan, and Jen Lacroix all getting on the board and with KP winning each of the first five draw controls. Foxboro made a change in the circle with Caroline Boudreau and Hallie Canfield taking the draws against Lacroix and the home team would win 10 of the next 11 draws to take control of the half. Junior Ally Curran spun and scored to cut the KP lead to one and then McGeary scored back-to-back goals both off DiCenso assists to put Foxboro ahead 4-3 and complete her hat trick. 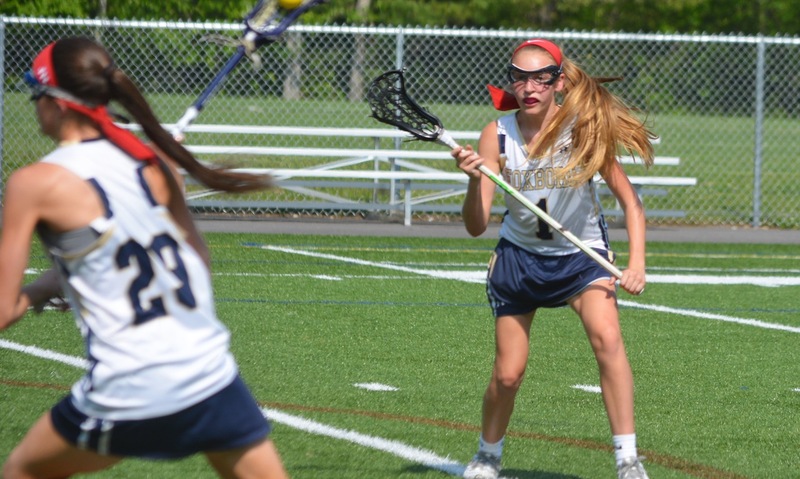 Foxboro extended the lead with another freshman, Lily Feeney, scoring a pair, the second on a great catch in traffic on a pass by classmate Megan Curran. KP called a timeout to regroup and Lacroix gave the Warriors a boost by scooping a ground ball in the defensive zone and racing the length of the field for a goal. With 27 seconds left in the half, Lacroix repeated that trick, this time from half, to keep KP in it before the break. KP scrambled in a goal that cut the lead to 6-5 but again Foxboro had a response. DiCenso scored with a sidearm shot on a free position, sophomore Catherine Luciano added another, and DiCenso drove to push the lead to four. With Foxboro leading 10-7 at the break, Luciano scored to make the lead four, but only a minute later Crowther got one back with a low angle shot and then 33 seconds after that Francesca Tonelli bounced in an eight-meter shot that made it a two-goal game. McGeary temporarily halted the comeback with a drive, but Lacroix scored her third of the game while KP was up a player. After Buchanan cut the lead to one, KP got an important boost from an unlikely source. Dana Truini scored a pair of goals to give KP its first lead since early in the first half. Sherry started feeling like the game was slipping away and starting to resemble the first meeting, so she called timeout to settle her team down. The timeout worked wonders as DiCenso scored with another free position to tie the game at 13-13 and a little more than a minute later she fed McGeary on a cut into the middle to put Foxboro back in front. With 3:08 left, DiCenso dodged past her marker and fired in a goal that put the game away. Sherry said, “It was a must win for us. I love the game that we had, putting the pressure on us and we had to perform. FOXBORO, Mass. – Nine minutes into the second half, the game had seemed over. Freshman Sophia DiCenso beat the Ashland goalie under the bar and Foxboro held an 8-2 lead as the Clockers were forced to take a timeout. But the Warriors only won four draw controls in the game and ever girls’ lacrosse coach will tell you that whoever wins the draws wins the game. The Clockers turned the game on its head with four goals in the next nine minutes to cut the lead to two and set up a frantic few minutes for Foxboro’s young attack. With Ashland double-teaming the ball at every opportunity, Foxboro looked nervous and a little hesitant, until DiCenso picked out sophomore midfielder Catherine Luciano cutting through the middle for the goal that calmed everyone down and allowed the Warriors to hold on for a 9-6 victory. “We panicked,” admitted Foxboro coach Brittany Sherry. “I think at that point I had three or four freshmen out there in attack, so we’re young and they need to realize get the ball moving and avoid the double, don’t let it come to you. DiCenso was once again Foxboro’s key player. The freshman has stepped right into the lineup for the defending league champions and she scored five goals and had that clutch assist in the closing minutes to lead the Warriors. DiCenso got the scoring started three minutes into the game with a shot on the run and then added a second a few minutes later off a free position. She then forced a turnover on the ride and fed it to Ally Curran who ran straight to goal and scored with a backhanded shot. Freshman Caroline McGeary had an overhand finish to make it 4-0 with 11:30 left in the half and Foxboro seemed to be cruising despite not having won any of the first five draws. The Warriors defense had been stalwart through the opening half, allowing only a few chances for the Clockers. Defenders Annie McGeary and Hallie Canfield were aided by good pressure from DiCenso and Luciano and fellow midfielders Lauren Flahive and Mackenzie Cusack. After Ashland got on the board, DiCenso cut through the middle and scored her third of the day. Melissa Lynch (five saves) came up with a big stop on an eight-meter chance and with only two seconds left in the half Curran scored on her eight-meter chance to make it 6-1. Ashland started the second half with a goal, but Foxboro answered back quickly to regain the momentum. DiCenso scored on an assist by Luciano before Lily Feeney had a goal disallowed for a player in the crease. The Clockers then had a goal taken off the board because of an illegal stick and DiCenso scored her fifth to make it 8-2 with 15:52 left. The Clockers scored twice from eight meters and once in transition to cut the lead down to three. With 6:07 left and Ashland’s defense scrambling to pressure whoever touched the ball, the visitors tacked on another with a good passing sequence to make it 8-6 and force Foxboro into a timeout. Curran nearly got her hat trick with a bouncing shot that clipped off the post and the Warriors started to settle down. Nerves were noticeably calmed when DiCenso flicked a pass over an onrushing double team to a wide open Luciano and the sophomore finished from close-range. Foxboro (8-2, 5-0) was able to run out the clock and preserve its third straight win. The Warriors will travel to Attleboro on Wednesday.